This is the best thermometer for you, parents of newborn babies and young children, looking for ensuring the safety of your beloved ones, and giving yourselves a peace of mind. The thermometer was manufactured in the world's highest quality standards and has FDA & CE certification. Flexible tip, rapid reading time and clear LCD display allows you short and efficient measuring, with minimum inconvenience while taking care of your infant. After a prolonged use you might run out of battery, but no need to have any concern about acquire a new one, we supply you an extra battery for your comfort. - Memory of last measured temperature. - Notified beeper for ready and finished measurements. -Fever Alarm when body temperature reaches 100.0°F. -Auto shut-off after 10 minuets. - Flexible tip with hygiene and high quality. - Regular measurement time: 30 seconds. 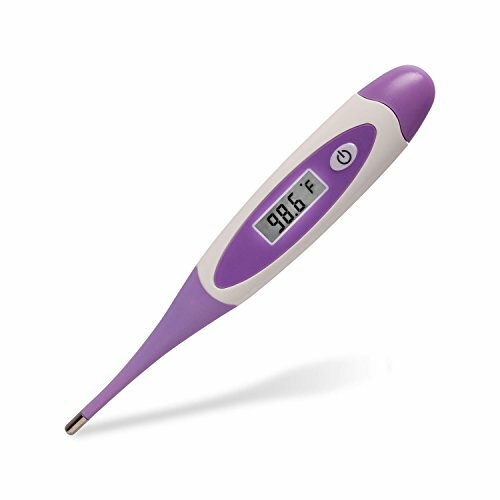 FDA & CE APPROVED: Rigorously tested, this thermometer has passed the highest standards for safety and accuracy by professionals. Accurate readings in only 30 seconds. SOFT FLEXIBLE TIP: The soft flexible thermometer tip is designed with the comfort and safety for your beloved infants, babies & children. EASY TO CLEAN: Waterproof design allows you maximum sanitation to prevent the spread of illness between your toddlers. ACCURATE: Accurate to within 0.2F. Easily diagnose fever or illness with the press of a button. Extra battery included. 100% MONEY BACK GURANTEE: At Purple Safety, we fully stand behind our product and offer you a no-questions-asked deal. If you don't love our Thermometer or if you don't feel 100% satisfied, we will refund your money. Customer satisfaction is our number one priority. So try it now! If you have any questions about this product by Purple Safety, contact us by completing and submitting the form below. If you are looking for a specif part number, please include it with your message.